8:00- Wake up, eat Chinese breakfast. This usually consists of zhou or rice porridge, a hard boiled egg, and usually something else. Sometimes I have dumplings for breakfast, I never know until I walk into the kitchen! 8:30- catch the bus to school. The time of my commute changes drastically depending on the amount of traffic that morning and how long I have to wait for a bus, but it usually takes me about 25 minutes to get to Bei Wai. It’s a great time to people watch though! If I have enough time before class, I might pop into the bakery right next to campus and chat with a few friends who also make this a custom. It feels like the LJ’s of JP’s of my China experience! 9:30- class. Right now I’m taking Chinese Literature, but my area studies courses are broken into blocks, so we take one class for about three weeks at a time, but at a very intense pace. I actually really like this method, because I can really focus on the material that we’re learning at the time. My Lit class has seven students, so we all have to contribute to the discussion! This has given me the opportunity to really get to know the material and get to know my classmates and their ideas. I absolutely love it though, to see China from the perspective of its authors, and what this creative outlet can teach us about the culture. 12:00- lunch. There are a multitude of options from the cafeteria on campus that has meals for one US dollar, to baozi or dumplings of the street, to more formal restaurants. I could go to every food place within walking distance of campus and never run out of options! I’ll probably do a post solely devoted to food sometime. This time might also be spent finishing homework or cramming for a Chinese quiz. 1:00- Chinese class. I’m in a class with two other students, so we all get lots of chances to talk and practice Chinese. I’ve already seen myself improve in a month of being here, so I can’t wait to see where I am by the time the program is done! After class I have my one on one session with a Chinese teacher, and I’m currently doing some extra learning about restaurant words, so that I can learn to order for myself here. 4:00- the language pledge lifts, so I’ll usually hang around and catch up with friends before heading home. Its been interesting having to think and speak Chinese only during the day. In a week, the language pledge will go to 24-7 on campus. With my language level, the language pledge has felt more like a vow of silence than anything else, because I just don’t have the vocabulary for the things I want to say yet. However, gesturing, pointing, grunting, and inserting English words when needed can be more effective than it seems! This is the time I might go on random food adventures or catch up emails (I never thought I would appreciate email until I’m 8-11 hours away from the people I love). Today we had our first Chinese test (and I think it went pretty well), so afterwards some friends and I went to the bakery and had a wonderful laughter filled conversation. 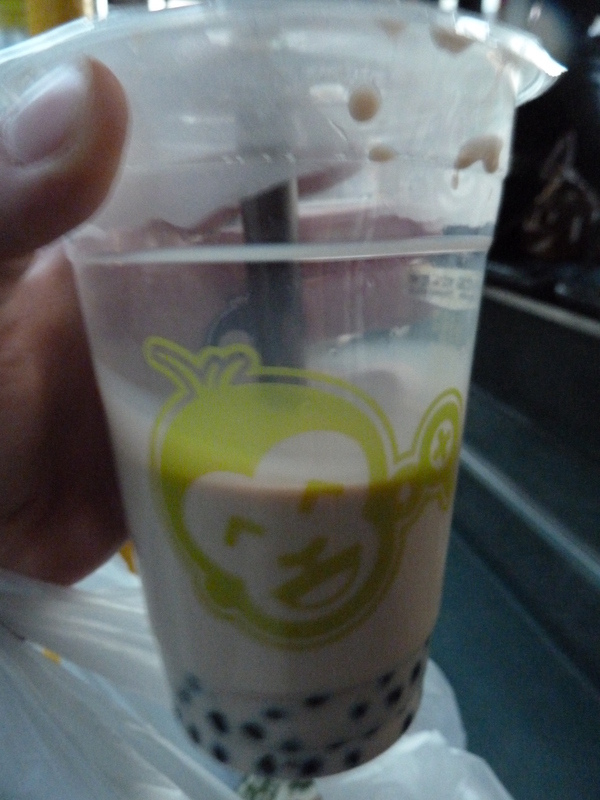 Below is hot milk tea, an afternoon favorite of mine- its basically like chai (served hot) with taro bubbles! So good! 5:30- go home. While in the morning everyone (including me) is tired and bustling off to work, the evenings are an interesting time to be out and about. I love hearing the Chinese language around me even though I want more than anything to understand what people are saying, I love the way Beijing lights up with neon as night falls, I love the little street food and bootleg DVD stands that are open as I walk home from the bus stop. I don’t love climbing five flights of stairs to get to my apartment quite so much, but I guess its getting me in shape for Tibet later in the semester. 6:30- dinner. This is one of my favorite parts of the day. Chinese food is awesome. Definitely not for the picky eater, but I’ll eat anything that’s placed in front of me unless it has an unnecessary amount of spice. For example, fish here is served totally whole with the eyes, head, tail, etc. still intact. I’m also improving my chopstick skills, though I still drop things a lot, it’s starting to feel natural to me. Tonight we had a dish with shrimp in it and that includes the shell, legs, and head. They’re fried to be crispy, and man are they delicious! 7:00+- I usually start homework at this point, or maybe watch some tv with my host dad first. Its interesting how much you can pick up from a show with only knowing a few words of the language. Later in the night is a time when friends in Holland start waking up and coming online so I’ve had a few surprise late night Skype chats, which fill me with so much joy. One challenge I’ve had here is adjusting to not having the Christian community at Hope. I’ve gone to some different churches and I’m praying for a group that I feel like I fit with! I’m headed to the city of Harbin to see their famous ice sculptures this weekend, so I’ll have lots of pictures and stories from that next week! Next Next post: Leaving for Spain!